I say Amazon is the God of e-commerce on the planet. Whatever you need, you can find it there. The best part is, if you like to take the hassle, they can ship your item anywhere. My recent experience with them is amazing. I honestly appreciate their actions and this is why I want to share my experience with everyone. On 11 May 2015 I ordered a Sony NWZE385 16GB MP3 player. It is always a hassle to import something in Bangladesh and go through the Bangladeshi Customs Regulations, this is why mostly I ship my needs to my friend’s address in Singapore and later somehow I manage to collect it from him. So the MP3 player got delivered on 27 May 2015 to my friend’s address in Singapore. Last week a friend was coming and he brought it to me all the way from Singapore. After receiving the device, I found they have sent me Sony NWZE383 4GB MP3 player instead of the one I wanted by mistake. I have ordered Sony NWZE385 16 GB and you have sent me Sony NWZE380 4 GB. What kind of business is that? 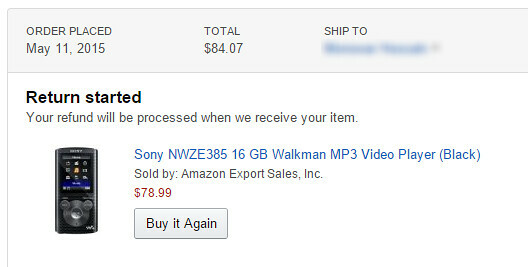 I’m sorry about the problem with the “Sony NWZE385 16 GB Walkman MP3 Video Player (Black)” that you had purchased. Please let us know whether you’d like a replacement for this item or whether you’d prefer a refund. Please visit the following link to provide the information we requested: link removed. Once we receive this information we can take further action. I’m sorry if this additional step might cause you any inconvenience. I hope you’ll understand that this will help us in assisting you more precisely. Thank you for your patience and understanding. We look forward to hearing from you soon.